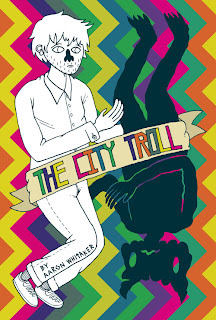 Aaron Whitaker breathes new life into the sad-sack loser/slice-of-life genre with his long-form debut, The City Troll. With page after page of simple, expressive art that emphasizes gesture, movement and body language, Whitaker skillfully moves his characters through a love triangle plot with a number of hilarious and moving twists and turns. The genius move Whitaker makes is to take the central conceit of mopey losers--their navel-gazing insistence that they are the center of their own narrative--and have its protagonist knowingly live his life as though he were a character in a story. The story is this: god capped off his creation by bringing to life The Perfect Man. His name is Ian, and all women fall in love with him and all men want to hang out with him. 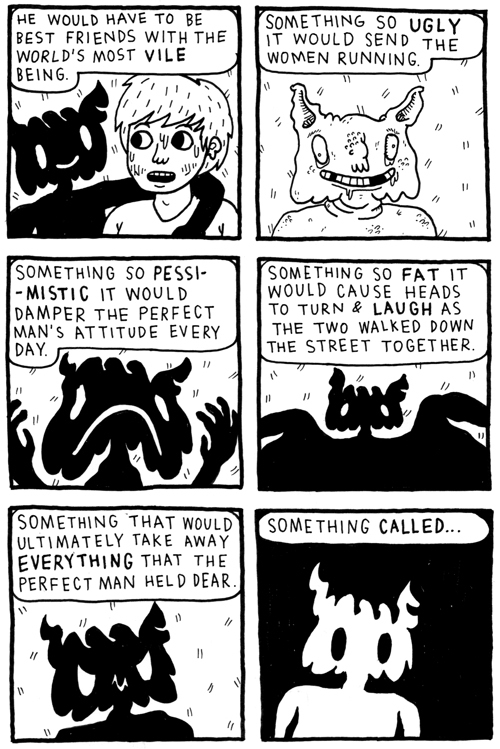 God grew jealous of his creation, so he cursed The Perfect Man by forcing him to be friends with the most loathsome, disgusting, pessimistic creature, and named it The City Troll. The City Troll, of course, is the imagined alter ego of Paul, a young man with massive confidence problems who survived living with an abusive mother. 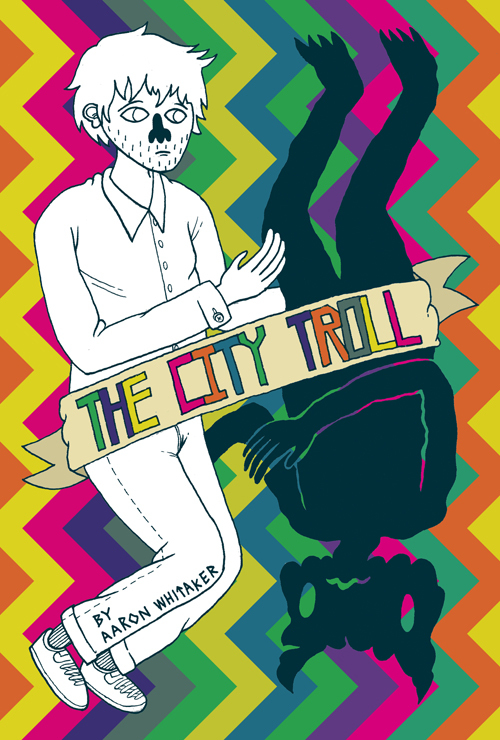 Whitaker nimbly moves back and forth from depicting Paul as himself and as the City Troll, depending on his mood and state of depression. It's a clever bit of magical realism that fits smoothly into the narrative thanks to his cartoony drawing style. There's another remarkable scene early in the book when Paul (who doubles as the narrator) describes the possibility of love at first sight as being a combination of one's first girlfriend, the "sixth grade teacher who always smelled like cucumber melon scented shampoo", a quirky indy actress, the image that first provided masturbation fodder and one's mother. That leads him to meet Emily. 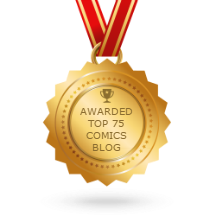 It's a wonderfully-written and drawn sequence, one that's remarkably evocative, funny and charming. Paul meets Emily but is too petrified to say anything, and she winds up with Ian. The "perfect man" description is quite apt; early in the book, he has to deal with having two women in love with him at once, then having to figure out how to get out of both of them wanting to be in a polyamorous relationship with him. Despite that, he remains remarkably devoted to his best friend Paul, and vice-versa. Paul suffers in silence as Ian dates Emily and they fall in love, even as Emily and Paul spend time together as screenwriters. That leads to a number of funny scenes where Paul tries to become a better person in order to translate that to one of his characters after Emily lists out that character's flaws. That includes a series of funny scenes with Paul, his father, and his father's new hippie girlfriend (named "Understanding"). Paul eventually does take action to try to win Emily, which leads to a clandestine affair. Paul tries to figure out a way to keep Emily and still stay friends with Paul, but it all blows up in his face. The end of the book contains its own critique, as a character who "wallows around in [his] own misery" isn't going to get the girl--especially when that girl has her own City Troll issues. Whitaker throws those clues in when Emily tries to make excuses for why she goes off her anti-depressants, claiming that they impeded her output as an artist. It becomes clear that she's not well by the end of the book in her own way, and Ian is a victim of the pathologies of two friends. At the same time, Paul eventually learns his lesson and makes tentative moves toward change by the end, even if it's not clear that he's learned how to be less selfish or more empathetic. There's a lot to chew on in this book, which is filled with funny and true-to-life dialogue, odd situations and characters who take on a life of their own. It's one of the more impressive debuts I've seen from a young cartoonist, and I'm excited to see what Whitaker chooses to do next.